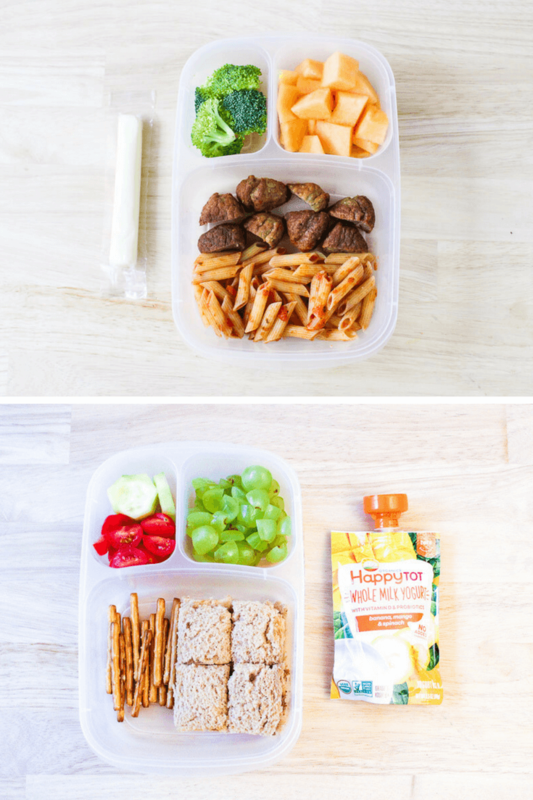 Why is it that toddler meals for lunch or to take to daycare seem so challenging? I mean, they eat a wide variety of fairly basic food, and we always make sure they are fed at home right? But for some reason, daycare lunch seems confusing—and I know I’m not alone in that thought! So many moms of Charlie’s daycare friends have said the same thing to me. 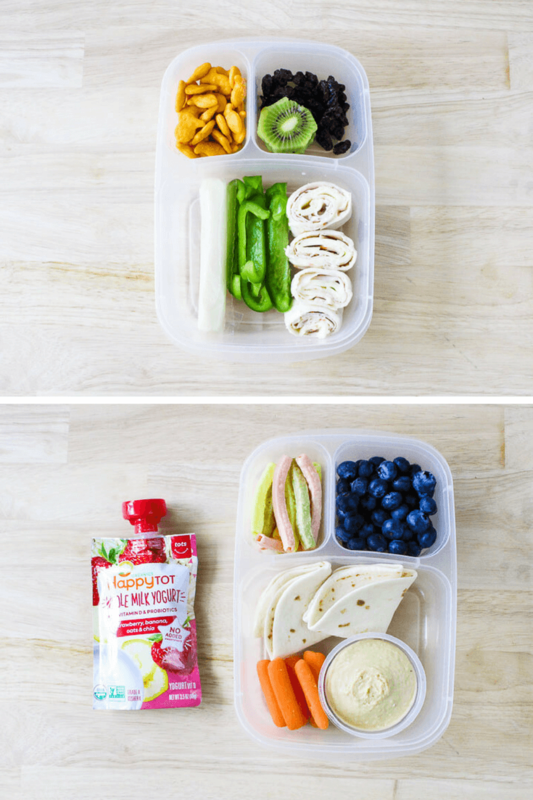 Everyone is looking for easy toddler lunch ideas for daycare, and rather than judging what others bring, we are actually scoping out their lunchboxes for ideas! I am what I like to call a healthy convenience meal packer. I try to make sure Charlie gets a variety of healthy, quality food, but I’m just not at the place where I can spend a ton of time crafting elaborate lunch boxes. I try new things when an idea pops up or someone recommends something, but most of the time, we cycle through the same basic meal options—and they work great! This post is sponsored by Happy Family but the content and opinions in the post are my own. Toddler lunches basically break down into a few categories (or at least that is how I look at it). I like to add something from all of the food groups, which makes it easy to think about what to add. 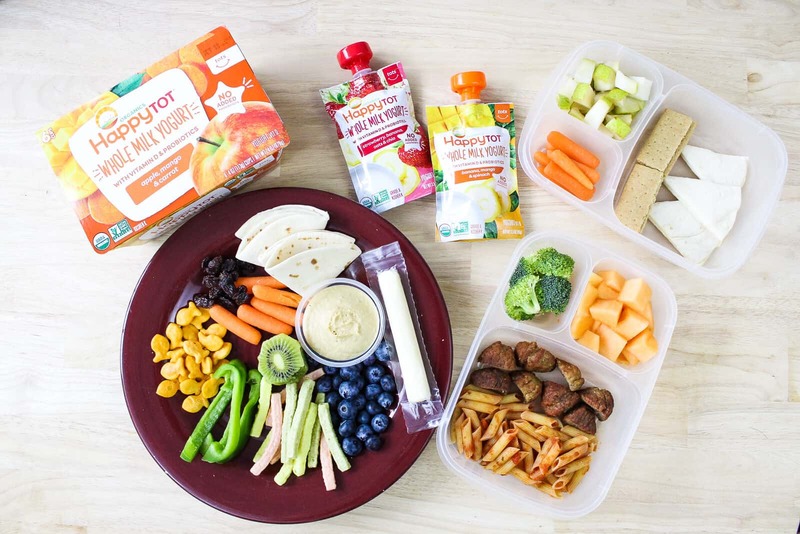 Here is a glimpse at a typical week in Charlie’s lunchbox to help you brainstorm more lunch ideas for toddlers at daycare or at home. Cooked veggies are also great (I always keep a bag of frozen peas, corn or carrots on hand for a quick 2 minute steam in the microwave as needed). For dairy products, we usually do string cheese, cheese in the main option, or yogurt. 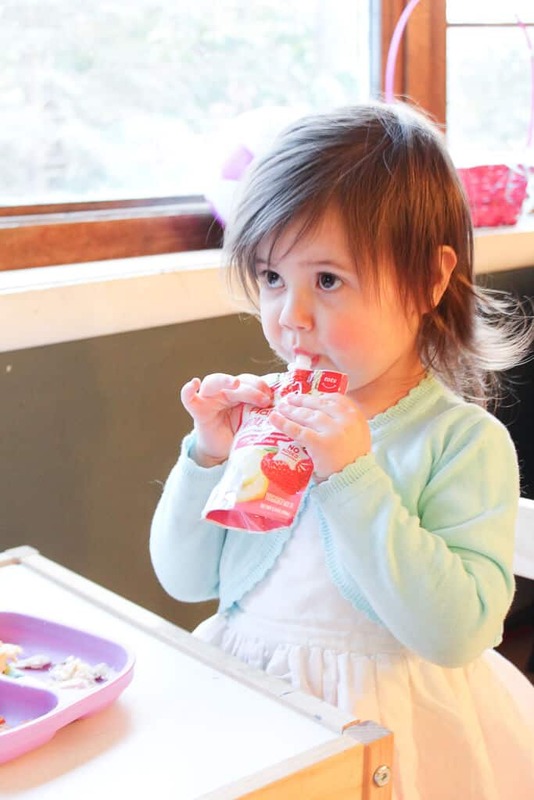 Yogurt pouches are my favorite, as they are so easy to toss into the bag and eat at school or on the go later on with less mess, though they are sometimes harder to find than cups. 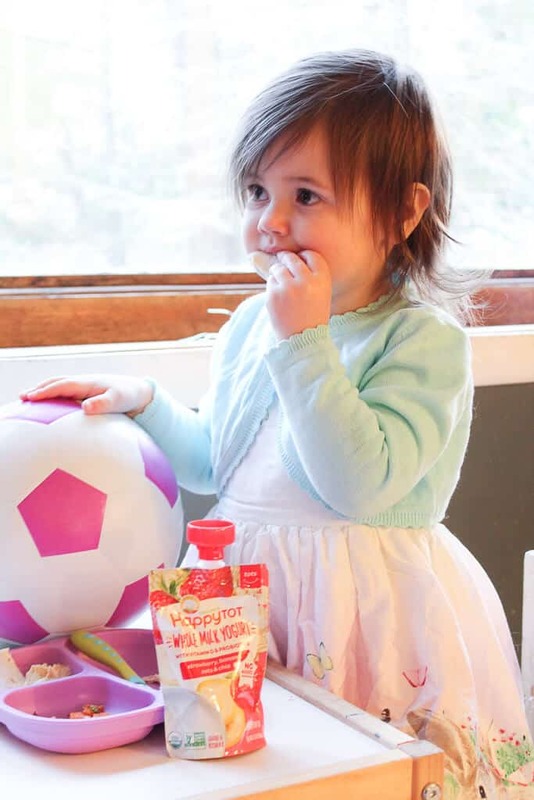 Recently, however, we found the HappyFamily new line of yogurt for babies and toddlers, and have been loving the HappyTot yogurt pouches for daycare! What’s really great about HappyTot Whole Milk Yogurt (apart from being in super convenient pouches) is that there is no added sweeteners like many other types of yogurt, and that they are made with whole milk with vitamin D and a great mix of ingredients (including probiotics and non-gmo). Charlie really likes the Strawberry Banana Oats & Chia one, and the Banana Mango & Spinach one is my favorite (got to sneak those veggies in when I can!) 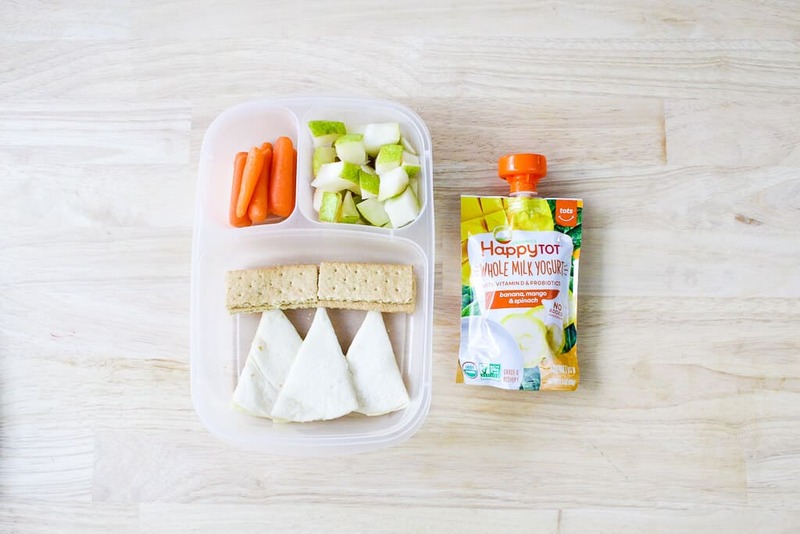 At home we love using the HappyTot Yogurt Cups too, especially Apple, Mango & Carrot. There are so many ways to use them too—check out these yummy yogurt treat ideas for kids! 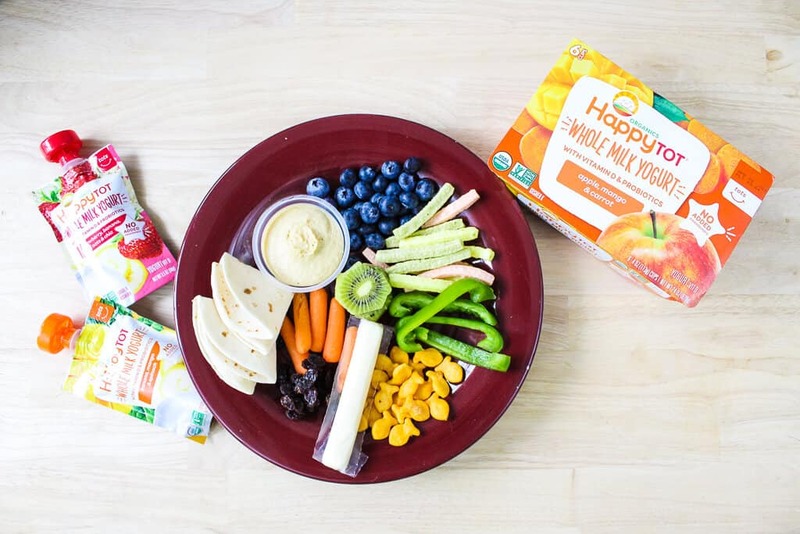 If you have a younger baby, check out the HappyFamily Baby’s First Whole Milk Yogurt—that would be a great starting option! Both types are available at stores everywhere, and I have a $1 off coupon for you to try them out! The easy part about just having different items on hand is that I can just pick one or two from each category or food group and add it to the lunchbox. I like to use these storage containers, which helps separate different items, or a bento box would work great as well. These ice packs are my favorite as they are flat and slim and don’t take up much space. I’ll add the yogurt pouches and snacks on top, and that’s it! Easy peasy. Are they the most original ideas? No way. But are they healthy and will my toddler eat them? Absolutely. And that, my friends, is what matters most! Be sure to check out HappyFamily for more info and don’t forget to grab your $1 off coupon here! 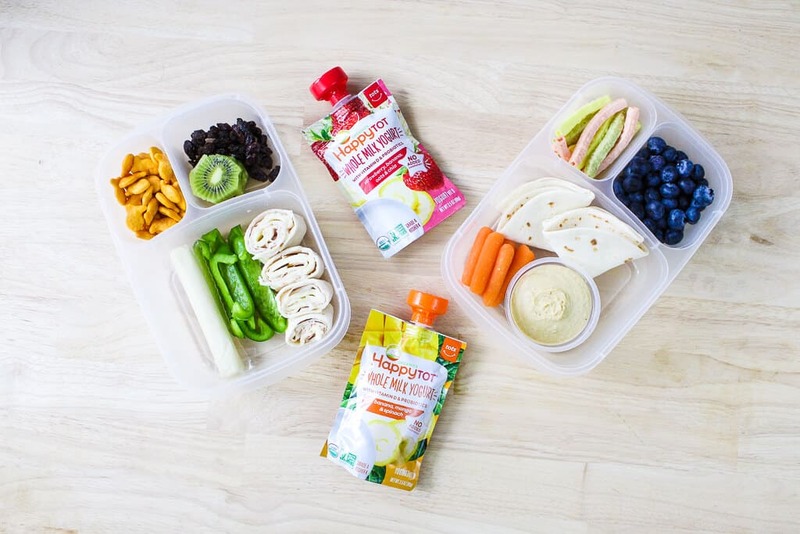 What are your go-to toddler lunch items? I’d love to find out to add more to my rotation! This piece comes together so beautifully! I love the suggestions. 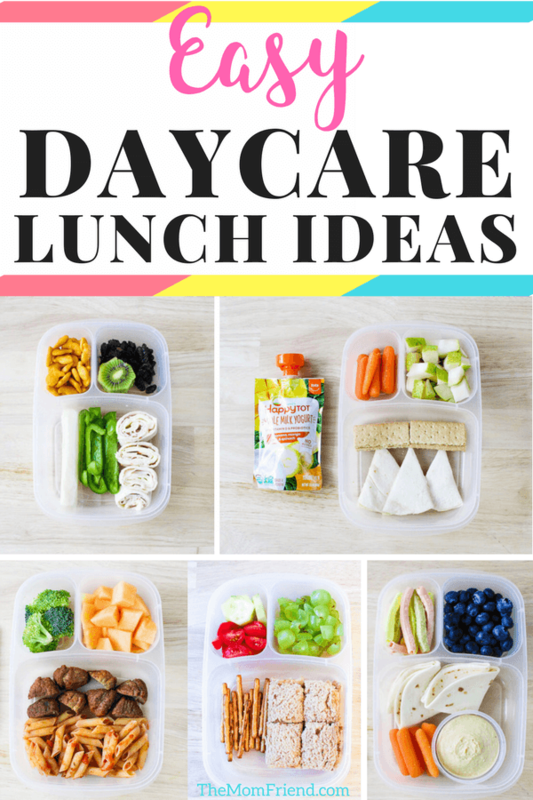 My littlest will be headed to daycare in just a few months and I love these ideas to switch up her meals. Wow, all of them are so amazing, I’m having troubles with my two year old boy, he doesn’t want to eat any vegetables, and just a few fruits, which makes the snacks and day care lunch my nightmare, because I don’t know what to do to feed him “properly” I’m so amazed about the food variety included at the pics, how do you manage your toddler to eat all of that food? pls any advise would help!